POLARaudio has announced the exclusive UK distribution of Cornered Audio speakers. 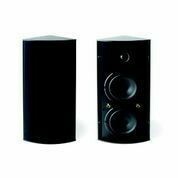 These loudspeakers are ergonomically designed for the provision of background music in a range of settings from retail environments to bars, entertainment venues and cafes. With a distinctly Scandinavian edge to design, form and function, they represent an interesting and decidedly original addition to POLARaudio's range. The unique mounting method of these cornered speakers allows for a large variety of different applications. With a 90-degree triangular shape, the design enables mounting to be flush against a wall or ceiling, without a bracket taking up space behind the cabinet. Mounting holes are integral to the cabinet design, with the result that installation time is reduced to a minimum. In terms of coverage, the speakers are designed with emphasis on uniform and wide dispersion, with special emphasis placed on phase through the crossover point and cone/dome geometry. A single cabinet offers approximately 90x90 degree dispersion but multiple cabinets can be used in conjunction to expand coverage. The versatility of the cornered speakers means that they can be positioned in various combinations for optimal coverage. In this way, two cabinets might be coupled together back to back and mounted flush onto walls and ceilings to offer 180 degrees of coverage, three cabinets can be mounted together around a corner to offer 270 degrees of coverage whilst four could be suspended together from a ceiling for full a 360 degrees. POLARaudio MD John Midgley looks forward to a successful relationship with another high-quality brand: "Cornered Audio represents another exciting opportunity to make available some extremely well designed and engineered audio products into the UK market. These specialist speakers are rugged but still aesthetically pleasing and take the concept of wall-mounted sound reinforcement to a very high level." Cornered Audio speakers will be exhibited on the POLARaudio stand (N-C13) at PLASA Focus Leeds (April 30th / May 1st). Also on display will be products from beyerdynamic, Behringer EUROCOM, AD Systems, Wyrestorm and Williams Sound.